Loose bodies are small loose fragments of cartilage or bone that float around the joint. 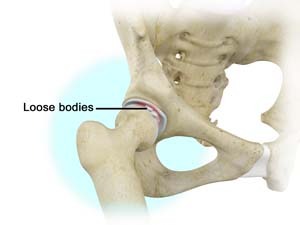 Loose bodies can cause pain, swelling, locking and catching of the joint. Loose bodies occur if there is bleeding within the joint, death of tissues lining the joints associated with conditions such as osteoarthritis and rheumatoid arthritis. Other causes include fractures, trauma, bone and cartilage inflammation, and benign tumors of the synovial membrane. Often X-rays help in diagnosing loose bodies. However, small loose bodies which contain tiny fragments of bone or no bone at all may not be visible on an X-ray. In such cases, other diagnostic tests such as CT scan or arthrography, MRI scan and ultrasound may be performed to locate the loose body. For small loose bodies your doctor may prescribe anti-inflammatory medications to relieve pain and swelling. However, any loose body that is causing the symptoms are removed. If loose bodies are present in the joint space a special instrument called a mechanical burr or resector is used to break up the loose bodies. The broken pieces will be easily degraded by the body by means of a mechanism called enzyme degradation. Large loose bodies which are caused by fractures, inflammation of bone and cartilage (osteocartilaginous loose bodies) are reduced and fixed to position using screws or pin. If the loose body is caused by a benign tumor of the synovial membrane, a procedure called partial synovectomy may be done. It involves removal of part of the synovium.